A.W.A.K.E. 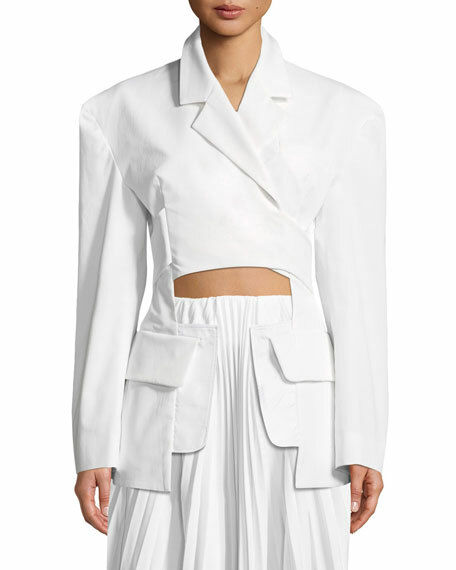 deconstructed blazer. Notched collar; hidden one-button front. Long, wide sleeves; button cuffs. 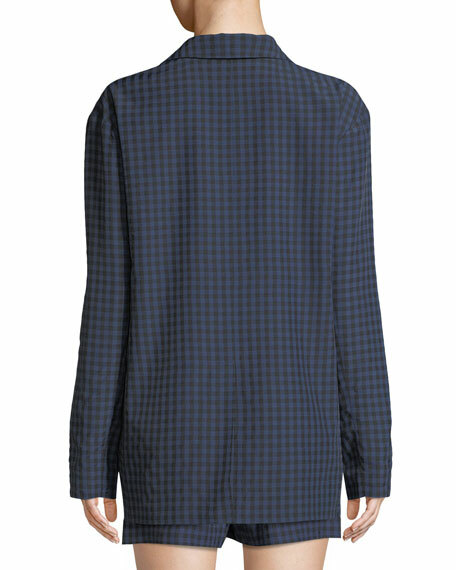 Dramatic, high-low hem. Extended, front patch pockets. Double split back hem with button and tie closures. Polyester; self lining. Made in United Kingdom. 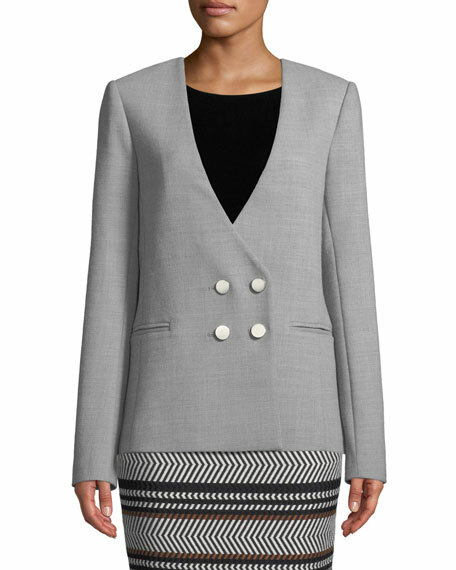 Badgley Mischka Collection twill woven blazer. Collarless V neckline. Long sleeves; button cuffs. Double-breasted front. Semi-fit silhouette. Side welt pockets. Mid-thigh length. Polyester/viscose/spandex. Polyester lining. Imported. 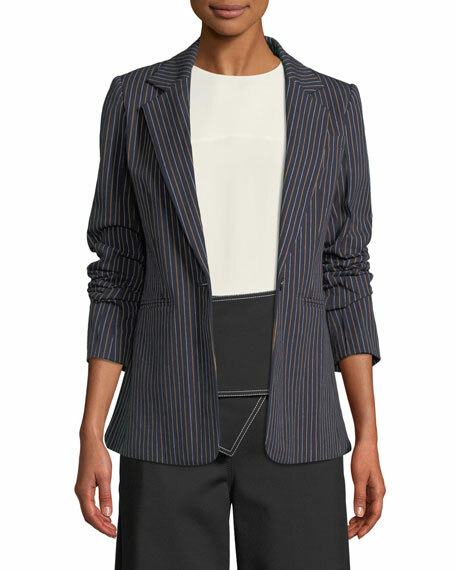 Derek Lam 10 Crosby blazer in striped stretch suiting. Notched lapels; single-button front. Long sleeves; button cuffs. Chest pocket; side welt pockets. Tailored fit. Cotton/spandex. Polyester lining. Imported. 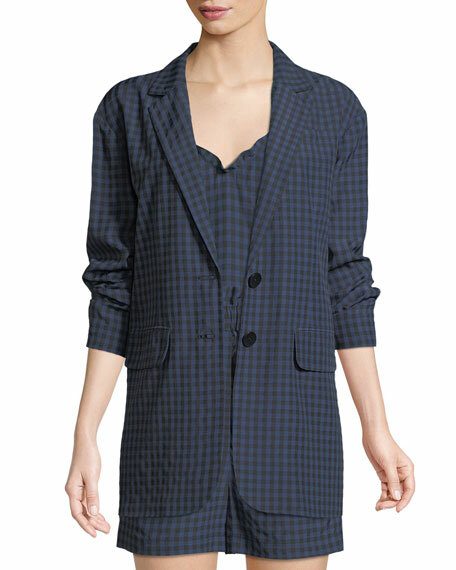 Derek Lam 10 Crosby blazer with embroidered panels. Peak lapels; double-breasted button details. Long sleeves; button cuffs. Chest welt pocket. Side flap pockets. Tailored fit. Vented back. Cotton/spandex. Dry clean. Imported.